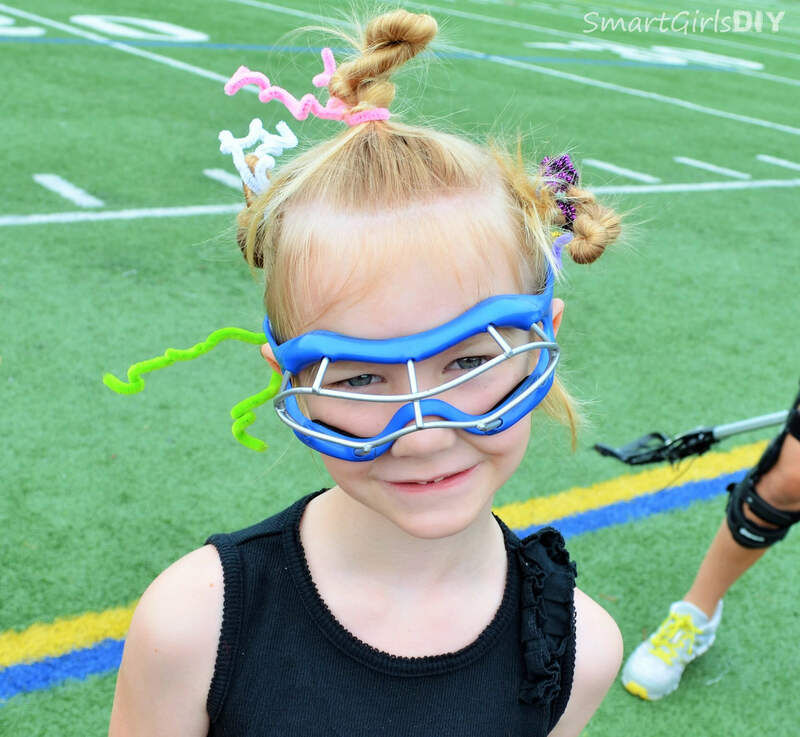 Last week both my daughters were at Lacrosse camp, playing in the blazing sun and heat for hours. Little Lulu (6-years-old) was certainly the hit of the camp. 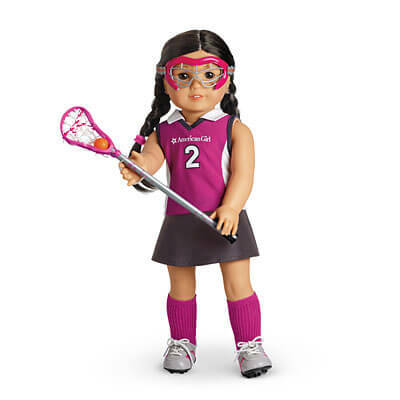 She brought her American Girl Doll the 2nd day, fully decked out like a lacrosse player. At $38 you can be sure I was not the one who purchased the outfit, that was my mom. There was a contest each day of camp and the second day was ‘decorate a water bottle’ day. 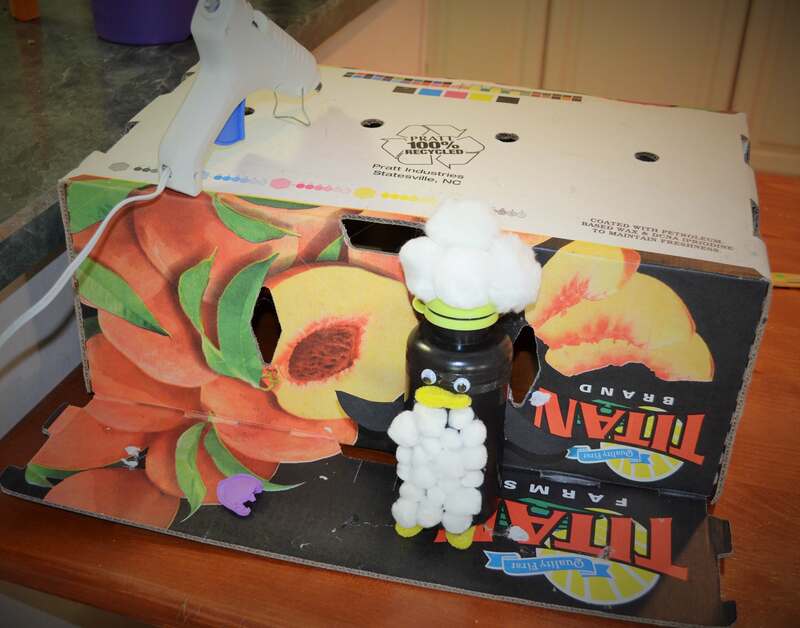 Smart Jr made a penguin and won 2nd place. Their favorite day was definitely crazy hair day. I put a bunch of twists in Lulu’s hair and wrapped chenille rods around each one. It was quick and easy and that was perfect for me after doing her sister’s hair. Smart Jr went full on CRAZY and won 1st place by a landslide. She was rocking a donut (doughnut) on a plate. In. Her. Hair. I had never attempted anything like this before and it took me at most 15 minutes to figure it out and finish. 1. Put hair in a high ponytail. We did it slightly to one side. 2. Cut a hole in a small plate and slip the ponytail through the hole. 3. 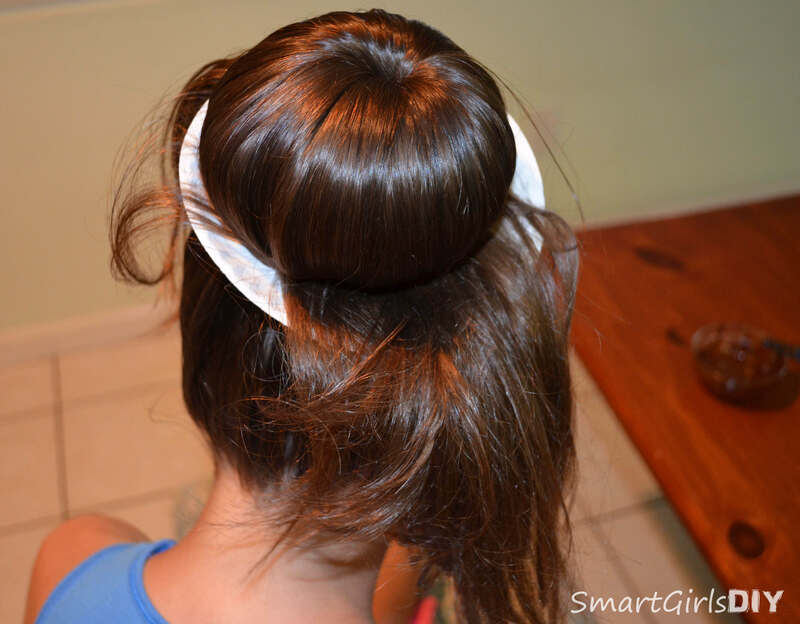 Wrap a sock (or 2 or 3) around the base of the ponytail to make a sock bun. We had never done a sock bun before! Tuck the end of the sock into itself. Of course you could also use one of those sock bun products, but we didn’t have one. 4. 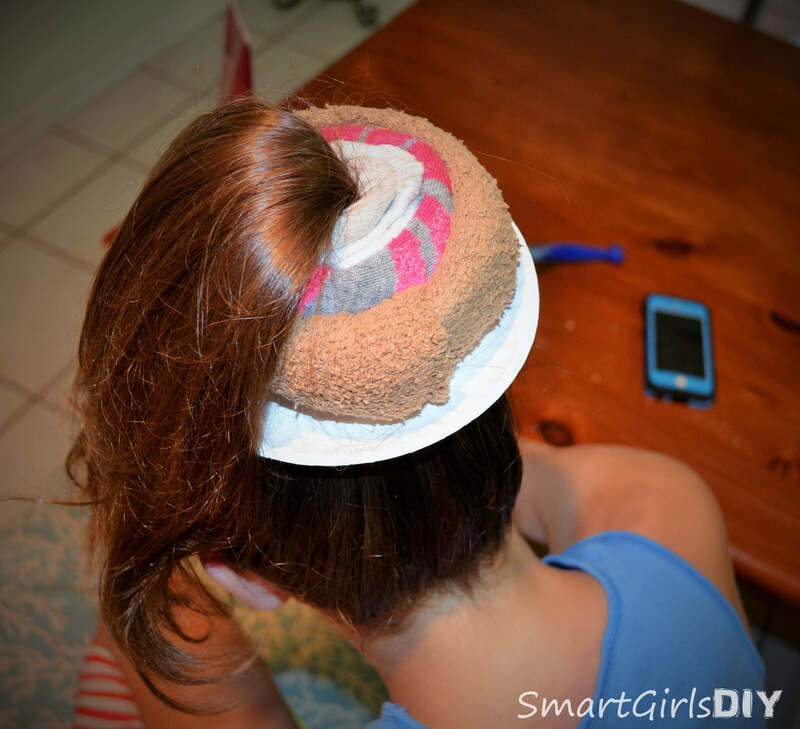 Let hair fall evenly over all areas of the sock and secure at the bottom with a rubber band. 5. Tuck remaining ends of hair under bun. Use another rubber band or bobby pins to secure. Add a few bobby pins on top to mush down bun to flatten it out a bit. 6. 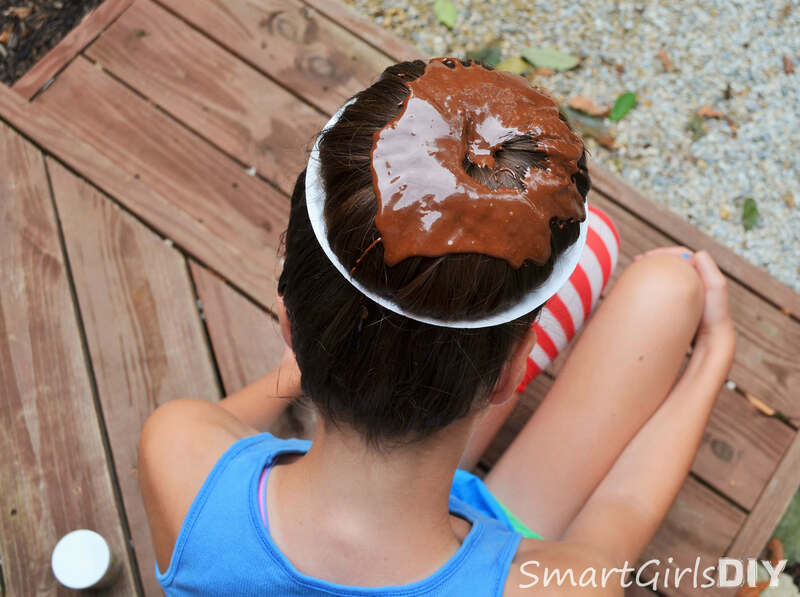 Make chocolate mix by adding hair gel to chocolate. Our chocolate was Hershey bars melted in the microwave. Let cool. 7. Go outside! 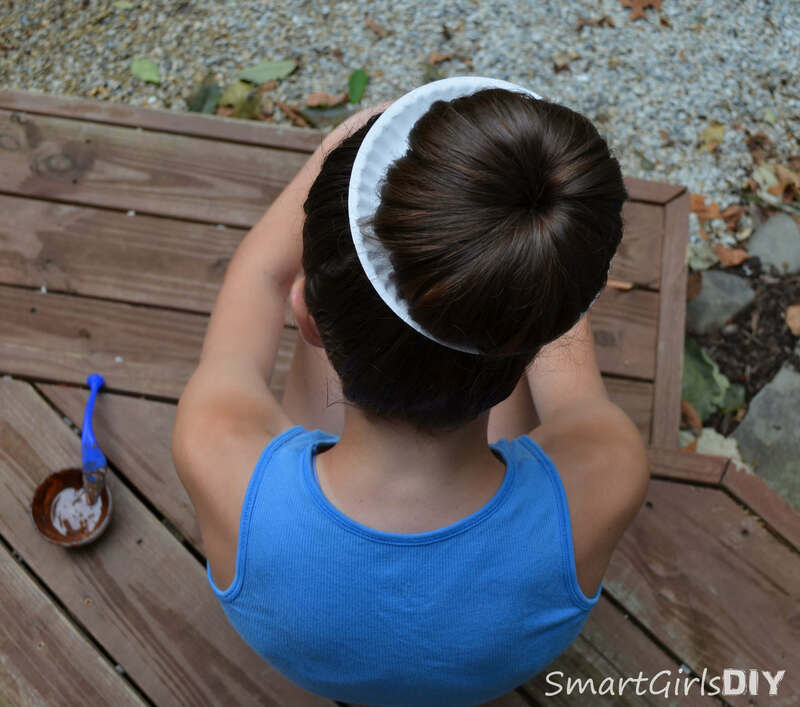 Spoon chocolate onto hair. Yeah, 1st place was a lock! 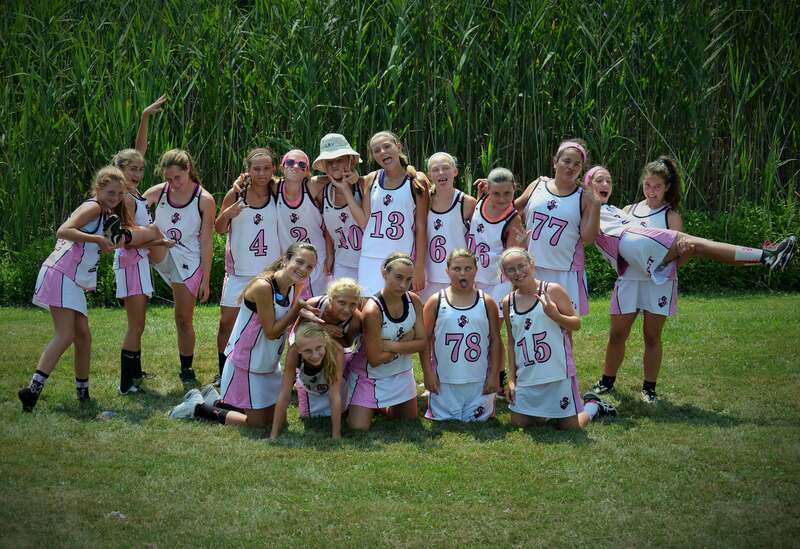 And after a long 4 days of lacrosse camp, she had her last a 2-day tournament with her summer team. They finished 2nd in the toughest division and the girls were super excited!!! Don’t you always have the kids do one picture with silly faces? That’s Smart Jr being held in the air by her teammate. ROFL! 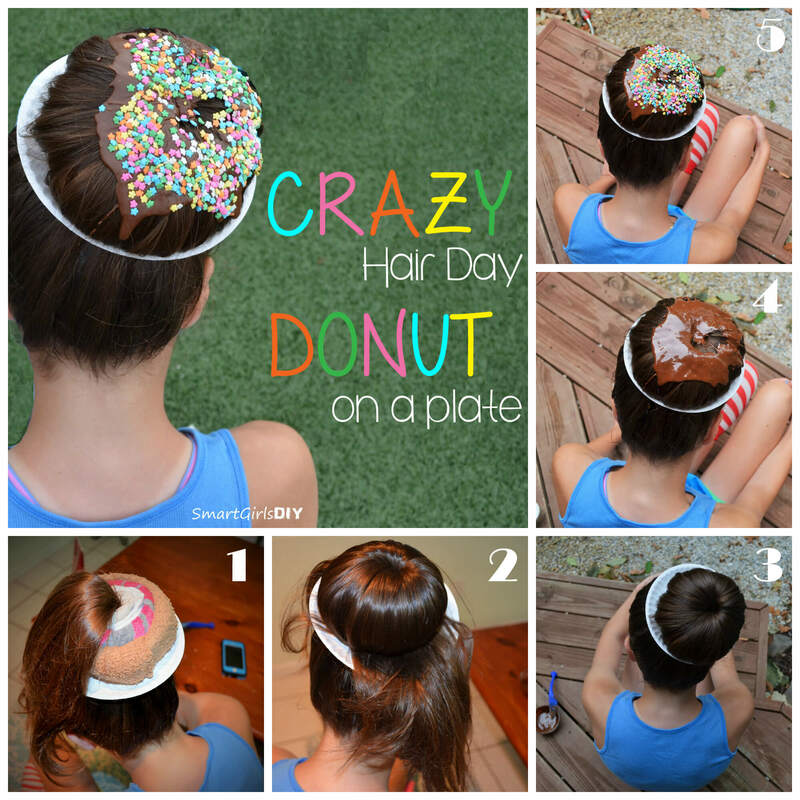 Totally love the doughnut hair bun! Why was my first thought that she should go to Wallmart with that updo? Maybe because that is what people do in Wallmart. Sometimes, I get a little freaked out by some of the people that shop there. It could be flashbacks of two male teens in unitards with a matching head cover or the wanna be Duck Dynasty families…just sayin’. Pipe cleaners – what is wrong with saying that name? I use them to clean our straws that come with our insulated cups. Anyway, I love her hair with them – too cute! Hehe. Walmart. It would have been fun for her to walk around with it more. She really just went to LAX practice, took it out, played and came home. I guess we’ll just have to do it again sometime! And I think I’ll try to make it smaller next time — fewer socks!! I hope you’re having a great summer!! Hi. Glad you like the hair! The hair gel + chocolate did dry but remained unstiff. You could definitely apply indoors. According to my daughter it washed out very easily — way easier than spray on hair color. You should go for it! You’ll be the envy of all your friends!! Thanks! And she did the penguin all by herself. Thanks so much .I will let you know how it goes. I love the donut bun idea!! Do you think there are any other things that could be used instead of real chocolate and sprinkles, but that would create the same effect? Hi AdeLine. I’m not sure about the chocolate, but you could certainly use some type of glitter of confetti for the sprinkles. I guess you could try dying the gel with food coloring?? But food coloring is probably messier than chocolate. Why are you against using the real stuff? Nope. It shouldn’t make any difference. Can u not use hair gel or will it work without it? I never tried it without hair gel, so I’m not sure. Why not just use the hair gel/chocolate combo??? It worked perfectly for us and this was our first attempt. I love the donut idea. Will be using it for my crazy hair this week coming. How much gel do you put in. I only used gel for the icing. The amount you see dripped is what I used. Maybe 1/2 cup. Idk. Why not use chocolate? OMG! 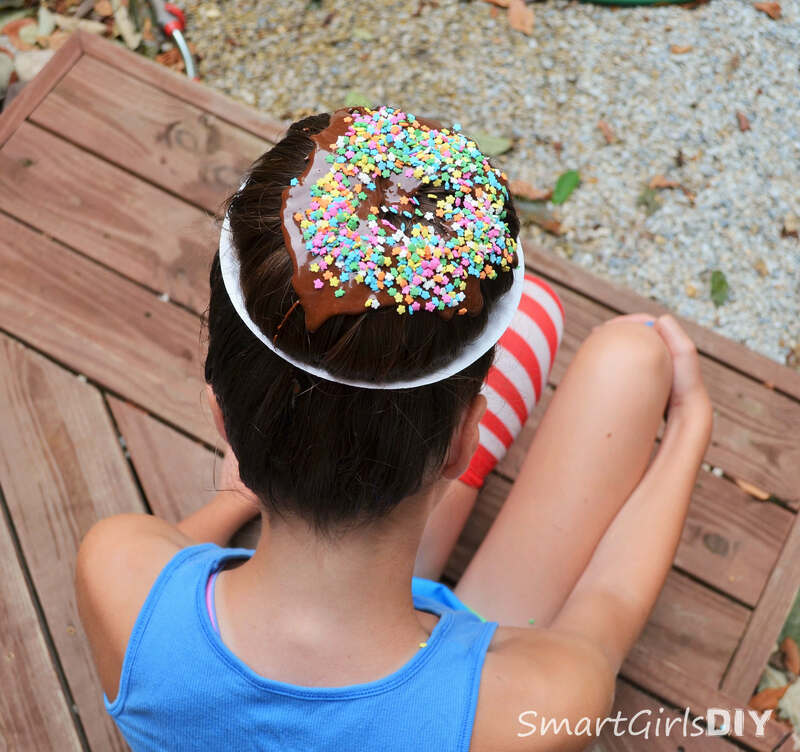 I love the idea of having a donut as a hairstyle . It’s soooo realistic that it makes me want to eat it . Just wondering, how long do u need to melt the chocolate? Just enough to get the chips to melt. Try 30 second increments and stir each time. And thanks!! OMG! Tried the doughnut for the first time on my girl for wacky hair day. Followed the tip for the chololate/gel “icing”…SUCCESS! Didn’t move or melt all day but washed out super-easy!! Thanks so much for the idea and great tips! What a creative idea! Questions about using real chocolate with hair gel: 1) Does it attract bugs like flies or bees if one is outside for long in warmish weather? (Does the hair gel in the mix help deter bugs?) , 2) How runny does it get? 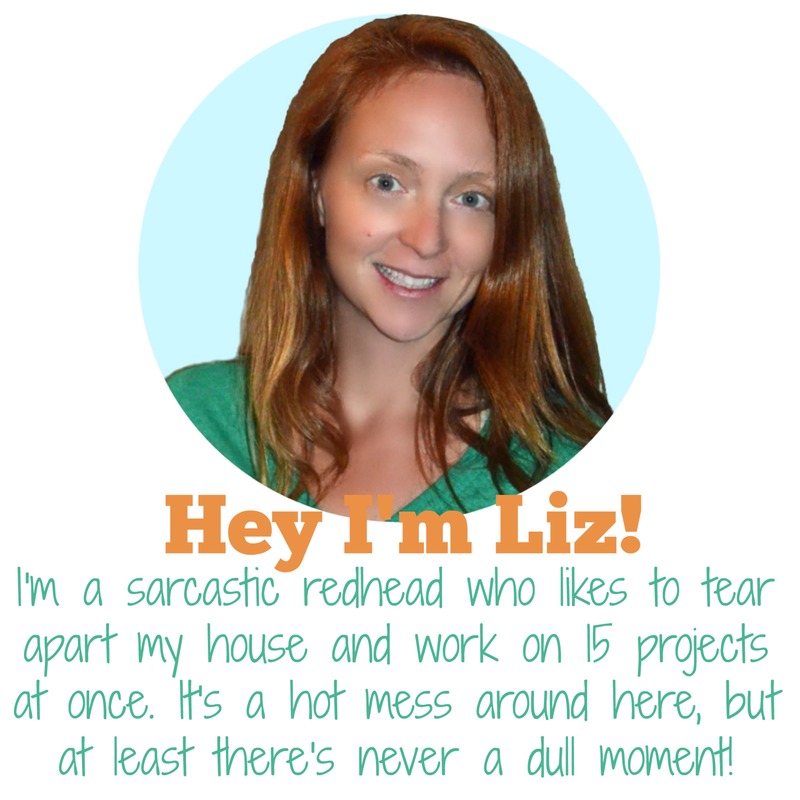 3) Do you think chocolate could stain lighter colored hair? If yes, do you think one could use white chocolate instead? I only ever did it this one time. I have no idea if chocolate could stain light hair, but I would guess no. I hate white chocolate. Also wouldn’t stand out in light hair. My daughter didn’t wear this for long, so I have no idea about the bugs. Thanks for the reply and for sharing your thoughts and creativity!